It’s no secret that Millennials are shaking up the way things are done in today’s society. As we’ve discussed before, Gen Y’s views on and expectations of brands has changed drastically from those held by the previous generation. Now, with this generation’s rampant use of social media, brands are looking to social commerce to attract Millennials (and their wallets). How are Millennials driving it? Time to state the obvious – social media is hugely popular amongst Millennials. Eight out of ten are members of at least one social network site, and nearly 80% of them log onto a social media site daily. While the main focus of their social media usage is to connect with friends, Gen Yers are also using their time on Facebook, Twitter and Pinterest to follow and support their favorite brands. Facebook is the most popular platform for Millennials when it comes to following brands. Specifically, 62% of respondents saying they follow a company/brand on Facebook, 23% follow a brand on Twitter, and 11% follow a brand on Pinterest. 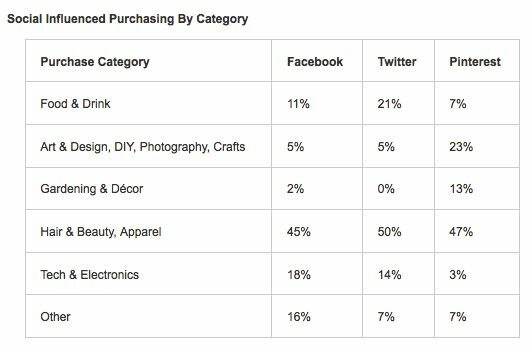 Hair, beauty and apparel are top categories when it comes to social-influenced purchasing. Who is using social commerce? Trying to seize the social commerce opportunity in front of them, brands are experimenting with ways to convert “likes” into dollar signs. One great example of a brand making the most out of their social channels is Free People, a clothing brand geared towards Millennials. Free People used Pinterest to pre-release a special capsule collection of holiday dresses. When users clicked on the pins, they were driven to a hidden section of FreePeople.com, where they could pre-order the limited-release dresses and get a further sneak peek at the rest of the holiday collection. Other fashion brands, such as H&M and J.Crew, have used Twitter and Instagram respectively to give followers a sneak peek at their upcoming fashion collections. Having a social media strategy is becoming less of a “could do” and more of a “should do,” especially for brands targeting Millennials. Research clearly shows how a company’s social channels are a great way to tap into their potential Gen Y customers. This group checks their social media accounts regularly, so brands that aren’t publishing content frequently on their Facebook, Twitter and Pinterest pages are missing a huge opportunity to help drive both online and offline sales. Are you using social commerce as part of your marketing strategy? What benefits have you seen? Let us know your thoughts on the subject in the comments section below!